- No mods planned, just hoping my son keeps it in one piece while at college. I have an OEM single CD player that I'd like get repaired for it. She bought her own vehicle earlier this year and I had the wagon shipped home so I could repair it. I cleaned up the wheels that were originally on Emmy (93 EX coupe wrecked in 2012), then spent 4 years on my 93 EX sedan (which may be for sale soon). Last edited by fleetw00d; 07-28-2017 at 12:04 AM. Not too much going on with this. My son had it at school and is now working for the summer near Indianapolis. Installed new B pipe last weekend - looks like the muffler is on its way out as well. Installed hood from a parts car - only has some nicks vs. rust spots on the one I took off. New fuel door (kids cracked it during the winter trying to get it open when frozen) from AZaccord - including painting to match! Ain't that a thing of beauty? 8/1/2017: Finally put it on the car a week ago. Car turned over 240,000 miles last week. Check engine light came on a couple times - codes 7 and 9. TPS and #1 cylinder position. For the time being, I pulled and reconnected all the connectors; cleaned a little oil out of the distributor. I have a spare throttle body and distributor if they come back. Last edited by fleetw00d; 08-01-2017 at 09:17 PM. Dec. 18, 2017: Codes came back, the Code 9 now coming on almost immediately when starting the car; couldn't it have waited a few weeks until they were home? Made a run in Ruby to Pensacola, FL, over Thanksgiving weekend to install a new throttle body and distributor to address the codes 7 and 9 before my son and daughter attempted to come home for Christmas. On the way home last Thursday the idle started surging. Checked all vacuum lines, installed new o-ring on FITV piston, swapped IACV because I had one, still surging. Finally got around to listening real close and could hear the vacuum leak - check the simple stuff first - the idle screw was backed way out (virtually no resistance to rotation). Installed new o-ring on the screw - problem solved. She's now at about 244,500. Last edited by fleetw00d; 01-16-2018 at 09:26 PM. That's a nice wagon Fleetwood. I really like those wheels. Those are survivors. They were originally on a 93 EX coupe I bought in 2004(? 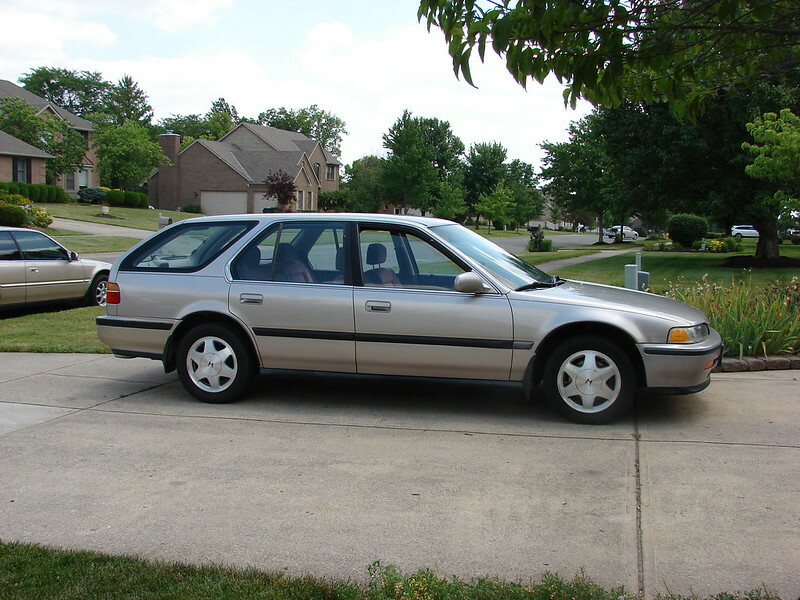 ), totaled that in an accident in 2012, then spent 4 years on a 93 EX sedan, now on the wagon. Still in pretty good shape. If it becomes necessary, RimWorks in Dayton, Ohio does a very good job of refinishing wheels to better than new (I think). They blast the wheel, powder coat the gray/silver all over, remachine the face, then clear powder coat. The smooth surface of the powder coating on the bulk of the wheel seems to minimize the amount of dirt/dust that accumulates. Rolled through 245,000 miles a few days ago. It looked a little better Thursday sitting an inch or two lower when my son and daughter had it fully loaded to go back to school. Do I smell a mild drop coming soon? So here's one I've never seen and always thought would be very cool. 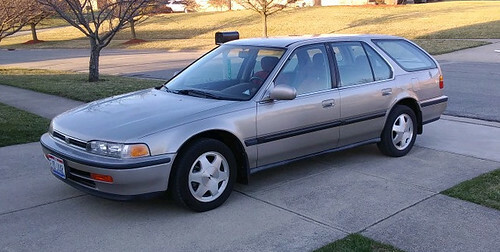 Has anyone ever "put together" a 93SE Wagon (using the leather, drive-train, brakes, dash, etc. and painted it cashmere metallic like mine. If not I'm surprised it hasn't been done... or has it? Probably not. If I lowered it, it would be even lower when fully loaded. As long as it is being used to haul college stuff back and forth to FL, I'll leave it at stock height. I can't say that I've seen one. 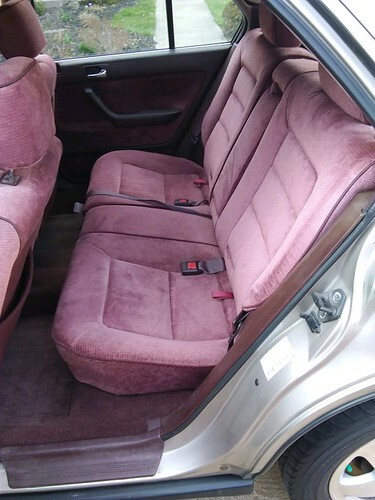 The rear seats are different in the wagon from the sedan, so those would have to be recovered. The drive train in an EX wagon is the same as the SE (although final drive or gear ratios may be slightly different - would have to double check). 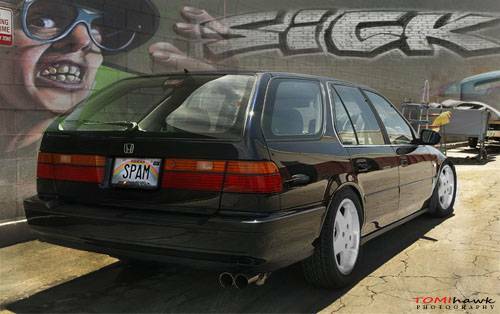 Brakes are bigger on the wagon, so you'd probably want to stick with them. Stereo uses five speakers (2 in the doors, two tweeters in the rear ceiling, one 6 x 9 woofer at left rear, so Bose system would require some modification (if you could even find a working system). Last edited by fleetw00d; 01-22-2018 at 04:02 PM. Man, I haven't seen a wagon that nice in a long time. All of your cars are super nice, so jealous. Hit 250,000 miles earlier this week. 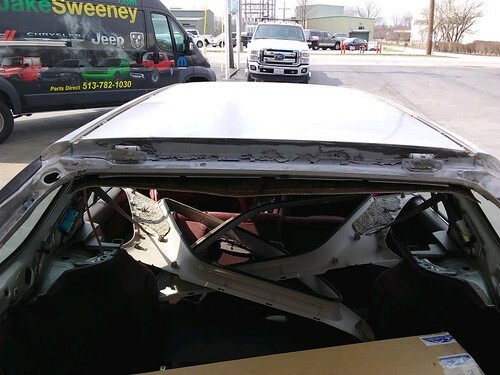 Visited 5 body shops yesterday to have them take a look at the rust on the back of the roof structure between the hatch hinges. Two basically said they wouldn't touch it, one wanted to peel the entire thing apart, two gave me estimates in the $1000 range, all subject to change depending on what they find. I'll have to drop the headliner to give them good access to the underside. What does the rust look like? What about the shop that did ruby? The seam where the roof panel (which folds down to where the hinges are) meets the rest of the structure is rusting. Last year I tried to wire brush and treat it (it was through in a few small places) and cover it, but it is back. The shop that did Ruby has changed hands twice; they no longer do rust repair. Mundane stuff. The rear lock cylinder no longer unlocked the lock, my antenna wasn't going all the way down. Disassembled the rear hatch to find the plastic clip that holds the lock rod to the latch was broken - easy fix. Pulled the left side of the interior to access the antenna and found a large puddle of water below the antenna. Looked like the antenna pocket, the quarter vent, and the tail light were leaking. Installed a rebuilt antenna and lined the inner bracket with electrical tape to increase the clamp on the seal of the outer plate. I was able to access the quarter vent by undoing the front edge of the left side of the bumper and pulling out enough to get my hand with a very short screwdriver to remove the vent. Created a new thicker gasket with some weatherstripping tape. Did the same with the tail light. Poured water over everything on the outside - no leaks evident. 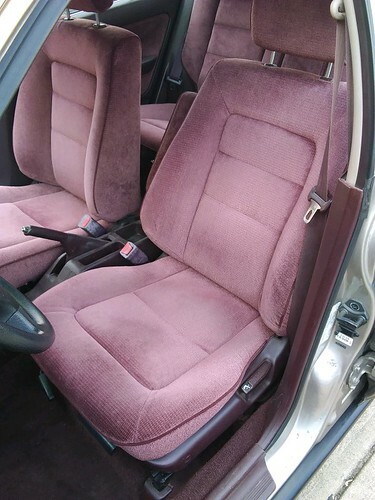 It is supposed to rain the next couple days; I'll leave the interior trim off to check it. Need to pull the right side and check for tail light leaks there. Jan. 7: Pulled the right side trim (top piece needed to be replaced anyway); all dry on that side. Installed another fuel door, the tabs that hold the cap while you're filling up were broken. Feb. 9: Rebuilt power steering pump and installed it; still had a puddle of fluid under the car the next day. Found the return line pipe to hose joint above the crossmember leaking; tightened the existing hose clamp and installed a second one for backup. Drain and fill of the transmission. Oil and filter change. 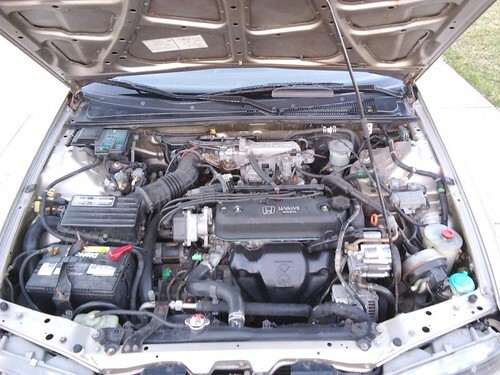 Installed cleaner valve cover. Installed new front pads the other day and adjusted the parking brake (lever always came up too high). While reinstalling the console, I discovered the left rear passenger foot well was quite wet (lots of rain lately). Have to wait until it warms up to try to find the leak. Last edited by fleetw00d; 02-09-2019 at 08:32 PM. Shop is going to seal it up with a two part (cures hard) seam sealer. I'll probably paint over that with body color. Last edited by fleetw00d; 03-20-2019 at 09:55 PM. Got it back Friday. 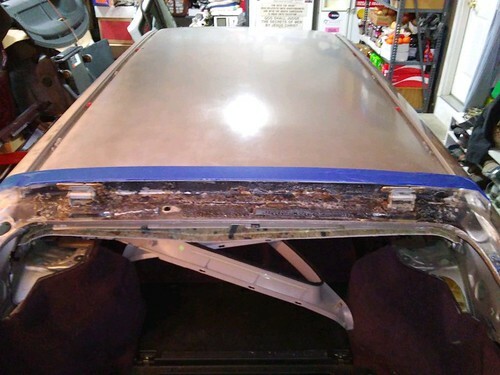 Painted the area early Saturday morning, installed hatch and wiring. It passed a water bucket test and then car wash test (it was covered in dust from the body shop). Installed all the interior pieces. Installed a right front axle; this has cured my vibration under acceleration problem. Painted black trim between the front and rear door windows on the driver side. Painted LR door rub strip. Refreshed the chrome strip on the tail lights. Just need to double check the balance shaft timing (shakes at idle) and probably install rear brakes shoes, then it'll pretty much be ready for market. Mar. 26, 2019: Compared the existing brake shoes to the new ones, probably still 2/3 thickness left so I didn't install new shoes. Balance shaft timing was OK.
Mar. 28, 2019: Found a hatch hose and wiper arm at Bessler's yesterday, installed both. Cleaned engine compartment and interior today. Last edited by fleetw00d; 03-30-2019 at 08:34 AM.